Smash soap sculptures with Rachel Lee Hovnanian, eat free hot dogs with Erwin Wurm, rave with Nick Cave, and more cultural intel to help you make the most of your weekend plans. On the occasion of its 20th anniversary, preeminent design gallery R & Company has put together an exhibition featuring the work of almost forty different designers (Wendell Castle, Katie Stout, the Haas brothers, and Lina Bo Bardi, among them) spanning several generations and representing four main movements the gallery has highlighted over the past two decades: Brazilian Modern Design, Postwar American Design, Contemporary Design, and “Difficult” Design. The exhibition will showcase major historical designs as well as new pieces commissioned just for the occasion, and will coincide with the release of a comprehensive new publication dedicated to the art and artists that represent, and have been represented by, the gallery. For the third and final installment of her interactive series, The Women’s Trilogy Project, the multidisciplinary artist Rachel Lee Hovnanian invites participants to confront notions of consumerism and beauty faced by women in contemporary society by literally smashing the sculptures that comprise her installation. Entitled “Pure,” the exhibition presents plaster sculptures of ivory soap bars that participants can destroy using a variety of tools—a cathartic and symbolic act that aims to break down notions of perfect, homogeneous beauty. Hot Dog Bus is an interactive public exhibition by the Austrian artist Erwin Wurm located in DUMBO’s Brooklyn Bridge Park. Originally staged in the artist’s home country as the currywurst-serving Curry Bus, the centerpiece of the exhibition, brought to the U.S. this summer by Public Art Fund, is a modified vintage Volkswagen Minibus-turned-food cart, with bulging bodywork and a bright yellow paint job that evokes ideas of consumption and consumerism. Designed to break down the traditional barriers between art and the public, the New York debut of Hot Dog Bus will, appropriately, serve free hot dogs on weekends, establishing a street food link of sorts between Austria and New York. Surveying the career of the seminal painter whose work illuminated the hopes and anxieties of 1930s rural America, this exhibition encompasses Grant Wood’s early decorative objects and oils, as well as his mature paintings and murals, anchored by “American Gothic,” his emblematic double portrait of Midwest America. This major retrospective of the Chicago-born painter encompasses his four-decade career and his efforts to articulate the African-American experience. 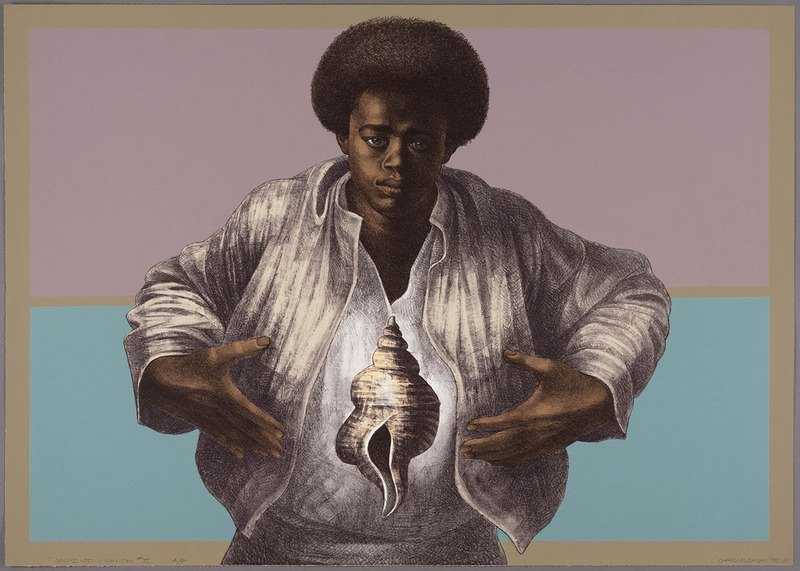 More than 80 paintings, drawings, and prints from the 1930s to ’70s chart the arc of his oeuvre from representation to figuration, his engagement with civil rights, and his powerful focus on identity, race, and history. From 1964 to 1966, London gallery Signals was a hub of experimental activity, staging presentations of artists, including Lygia Clark and Jesus Rafael Soto, that linked national and international avant-garde networks. This exhibition celebrates its legacy by bringing together the works of its founders, artists David Medalla, Gustav Metzger, and Marcello Salvadori; mapping its aesthetic connections with Latin American and Western European artists; and highlighting the British artists who emerged out of its orbit.